Attic and crawl spaces are the storehouse of all our superfluous but precious baggage. Memories and other belongings that are not required on a daily basis are shoved inside these dark areas and the door locked for years and years. The “shut out” area starts to become the breeding ground for insects, pests, microorganisms and small animals and they start to nibble away at whatever they find. Nothing is safe from their teeth, be it the ducting, insulation, wiring and woodwork, all can be eaten away causing immense damage. To apply corrective measures it costs money so isn’t it better to avail our free inspection service. 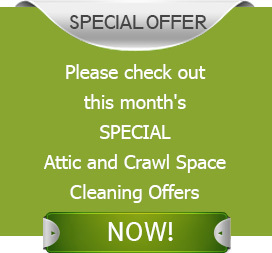 Just contact Quartz Solutions and we will help you clean your attic and crawl spaces to perfection. 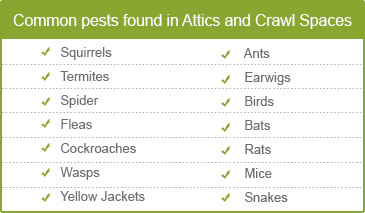 Attics and crawl spaces hide insects like termites, ants, spiders, yellow jackets, and wasps. These insects attack foundation, insulation, woodwork, wiring, and ducting to satisfy their hunger pangs. Small animals like squirrels, rodents, rats and mice are always on an eating spree and they gobble away whatever they can get their teeth on. The regular and continuous gnawing ruins the ducting and this becomes the main reason for duct leakages. This destroys the temperature balance in the home and leads to the buildup of humidity encouraging growth of mold, mildew and rust. The woodwork starts to give away and loads of structural damage becomes evident. The microorganisms lead to protozoan infections that can be very harmful for health if left untreated. A carcinogenic gas, radon, has been detected often in crawl spaces and this needs to be treated at the earliest. Millions of microorganisms, large number of small animals like birds, rats, owls or rodents, and hundreds of insects satisfy their food cravings by eating away everything that has been kept in the dark attic and crawl spaces. What happens if these pests manage to sneak into your bedroom? The thought is scary, isn’t it? You need to get the area cleaned right away. Quartz Solutions lends a helping hand by organizing a free inspection to search out all the infestation in your attic and crawl spaces. Can you be at peace knowing that your attic and crawl spaces is bustling with pests, animals and creepy crawlies? Avail our expert free inspection offer now! Quartz Solutions offers a free inspection for all and this proves that we want the homes of our customer to stay clean always. We prepare improvement and cleaning packages at the least expensive rates and promise to keep your home healthy and infestation free. Just contact us at Quartz Solutions. Residents claim that Haledon is a beautiful region to reside and raise a family. The attractive sidewalks, streets, neighborhoods, and the “Victorian villas” all are characteristic of Haledon. With a limited villa structure, Haledon has just about 8395 people living and each of them desires their home to be clean of infestation. We, at Quartz Solutions use eco-friendly methods to clean your attic and crawl spaces and promise to provide you a bug and pest free life. So, contact us at: 973-536-1013 now for a free inspection!